Qualified leads are hard to get; you can’t afford to lose or waste them. 70% of the qualified leads that make it to sales get disqualified or discarded, often because they just aren’t ready to buy now. 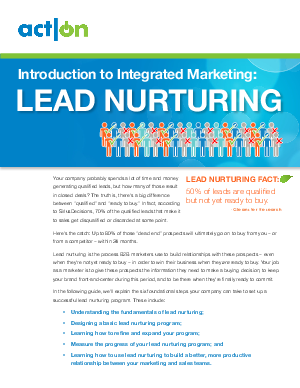 But 80% of those "bad" leads will ultimately go on to buy from you – or from a competitor – within 24 months. What to do? Nurture them until they’re ready to buy.